Nato countries are taking part in their biggest ever joint military exercises in Poland, amid concerns about a potential threat from Russia. 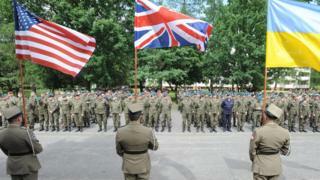 Some 31,000 Polish, US and other troops are participating in the land, sea and air exercises called Anaconda-16. It comes weeks before a Nato summit at which leaders are expected to decide to base a significant number of Nato troops in Poland and the Baltic states. Russia says Nato troops close to its borders are a threat to its security. Foreign Minister Sergey Lavrov said: "We do not hide that we have a negative attitude toward the Nato line of moving its military infrastructure to our borders, drawing other countries into military unit activities. "This will activate the Russian sovereign the right to provide its own safety with methods that are adequate for today's risks." The Anaconda exercises began in 2006 and take place every two years. About 12,000 Polish and 14,000 US troops will take part this time, as well as 1,000 from the UK and others from Nato states and five partner nations. The exercises are intended to test Nato's ability to respond to threats. But the BBC's correspondent in Warsaw, Adam Easton, says there's been a heightened sense of alarm in eastern Europe since Russia annexed Crimea two years ago and Anaconda is a way of reassuring those countries that the Nato military alliance is serious about their security.